Hand strung rosaries made with strong Flexible Wire (cable). For questions on Measurements and to read about Construction techniques, visit the FAQ page. Many new rosaries waiting to be listed. Please do not hesitate to contact me if you are interested in one that is sold, as I often have all parts in stock. 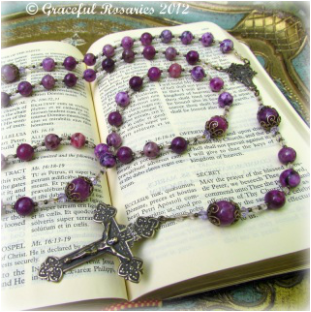 For information about the measurements of these rosaries, please see the Rosary Buying Guide. have 6mm Gemstone Ave Beads, and are approximately 25 inches in length from the crucifix to the middle of the second decade. 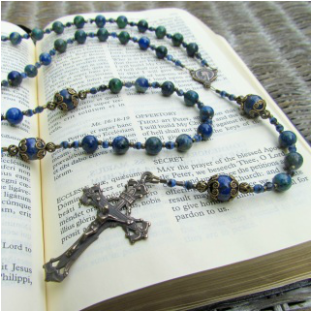 Click the image above to view Medium-size Cable Rosaries. have 8mm Gemstone Ave Beads, and are approximately 25 inches in length from the crucifix to the middle of the second decade. Click the image above to view Large-size Cable Rosaries.